Adopted in June 17, 2011. 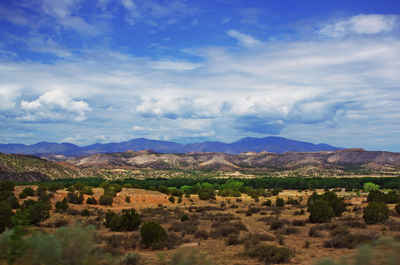 New Mexico has an official state necklace because of a new law. Gov. Susana Martinez signed a measure Monday designating the Native American squash blossom necklace as the official necklace of New Mexico. The law takes effect June 17, 2011. 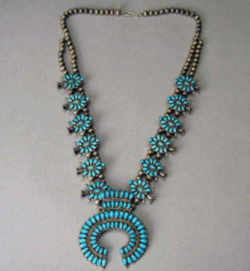 The necklace features silver beads called squash blossoms with turquoise or other gem stones. The necklace joins a long list of state symbols, such as the state flower, bird, insect and cookie. Squash blossom" is a term which has long been applied to a unique necklace produced by Southwestern Indians. It was first made by the Navajo and later by the Zuni and Hopi Indians. To this day it is still made by these three tribes, either to be worn by the Indians or for sale. The term squash blossom was evidently attached at an early date to the unusual bead which has a flowering end. The Navajo word "Chil Bitan" means flower-like bead, or more literally translated, "bead which spreads out." However, the flower is not believed to be a squash blossom, and really does not resemble one: it is like a young pomegranate. The pomegranate was a symbol of Granada, Spain, and Spanish and Mexican dandies wore a small silver version of this symbol to decorate their blouses, capes, and trousers. Navajo Indians may have seen one of these decorations and incorporated it into a plain silver bead necklace. They had already borrowed the Spanish crescent moon and star symbol which was attached to the horse's bridle, on the center of the animal's forehead. Navajo craftsmen simplified this theme, often to a plain crescent; in fact, the Navajo word for this ornament is "nazhahi" - now commonly spelled naja which means crescent. 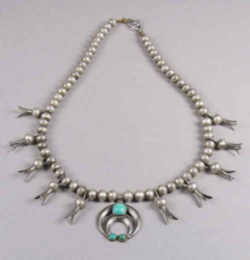 The naja was first worn with plain silver beads, but later became a part of the distinctive squash blossom necklace. The law designating the Native American squash blossom necklace as the official New Mexico state necklace is found in the 2013 New Mexico Statutes, Article 3, Section 12-4-4 U.